With campaign stops in both Savannah and Macon yesterday, Elizabeth Edwards again demonstrated that she and Sen. John Edwards are committed to campaigning in all of Georgia-and well they should. John Edwards' message resonates in Georgia like none other. As Elizabeth quickly points out, John Edwards is the only candidate in the race to put forward an agenda for rural America. And, in a Georgia where one in five children live in poverty, he is the only candidate in the race who is really talking about that issue. First, I want you to know that everything you have heard about this women is true. She is smart, compassionate, and fully engaged in this campaign, but most of all- she is real. There is not an ounce of pretension anywhere in Elizabeth Edwards. My favorite moment, of many good moments, was when she dropped to her knee to hug a volunteer, Julie Simon, who had found a seat on the floor of the crowded house. Yesterday, as the time neared for Elizabeth Edwards to leave for Macon, the National Weather Service issued a severe thunderstorm watch and lightning was popping all around the Macon airport. When she arrived after being grounded in Savannah for about an hour, she was greeted by a large and diverse group of Democrats. To her credit, as she arrived, she took the time to make her way through the crowded house, speaking-really listening-to nearly everyone there. At the beginning of the event, David Cusson (the host) was notably absent. Elizabeth told us that he was coaching his child's Little League Championship game. When David and his son, Carter, came in toward the end of the event, they received a loud round of applause. Elizabeth said, "he's been where any Democrat in this room would've been-at their child's game." Now, that's family values in action. "This is not about us," she said. "If this were about us, we would go home, enjoy our children, be pampered or travel the world. But it's not about us or some title John wants to hold. It is about something much bigger. It's about all of us." 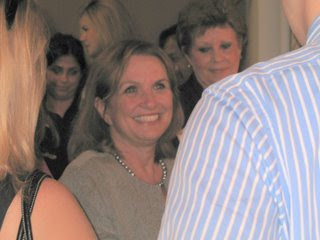 Elizabeth Edwards' petite but powerful presence, in Middle Georgia on a Tuesday night, spoke louder than her words. What a wonderful First Lady she would make. Thanks to Tina for all the pictures, including the one posted here! that last quote literally brought tears to my eyes. Been a LONG time since any political event or person made that happen. Awesome time, great crowd, great attendees, and one amazing woman. Yes, me, too. You just know that this a women who is telling you the truth, and truth is all to rare a commodity these days. Thanks for coming, Tim. Y'all did a great organizing the event. The fact that you remembered the YD from Valdosta and introduced her to Elizabeth when she entered, literally made her night. You, Chuck Byrd, and everyone else did a great job with the event. Edwards is definitely a friend of rural Georgia. Thanks, Rural. I'm glad that everyone could come, and it was really important to have YD's there. It sounds like a slogan, but they are literally the future of the party. I understand that Elizabeth had a great time at the party, too!